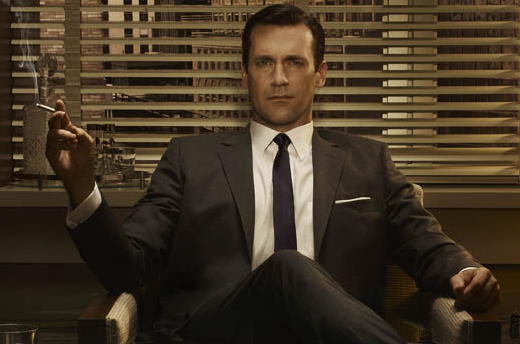 What Makes a Great Creative Brief? A similar question was posted on Quora and elicited a number of different but very interesting responses. It just goes to show that there is still a lot of controversy when it comes to creative briefs in marketing. If you come from the agency side, you are used to a certain format. Big companies and small companies have different needs, and so their briefs are also formatted differently. From the discussion thread I liked two presentations that were shared, posted below. The first is an interesting research done by Jasmin Cheng (from Twist Image) about creative briefs in the industry, and the second is a presentation by Nick Emmel on how to properly write a creative brief. While they don’t settle the discussion, are good sources for inspiration nonetheless. And, if you’re interested in looking at some different formats for creative briefs, check out this blog post on creative brief template review. Are you tired of what your marketing emails look like? Are you in search of inspiration? Or just want to see what’s out there? Well, this post may be the answer! Whenever my team talks about changing the design of our email campaigns, we start off my talking about emails we received in the past and that we liked. We also spend some time talking about the emails we hated and those that could be improved. We come out with a list of things to think about and that we could be using in our own campaigns. Is always good to see what’s out there to give you some ideas. After searching a bit on the web I couldn’t find any “email design gallery” or something like it that would show me different email designs. 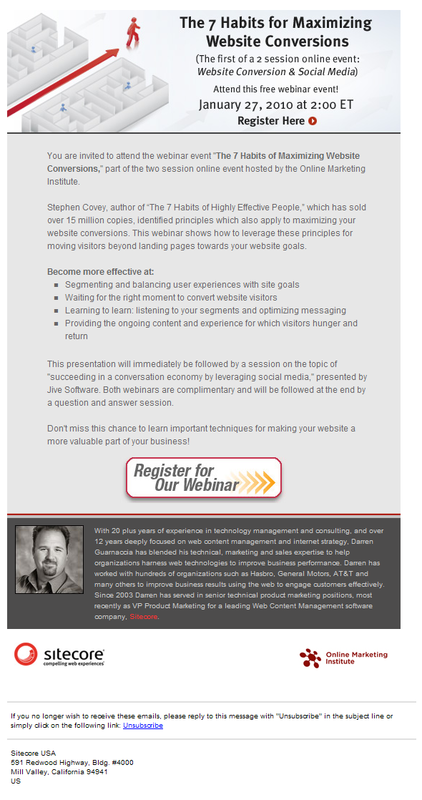 Sure, our email marketing software has some canned templates but they are very bland. I was looking for some real-life good looking HTML emails I could use as a reference. So I decided to create one and share with you. This is the first post of a series that will show you some marketing emails (webinar invitations, whitepaper downloads, product announcements, etc.) so that you can take this back to your team for your very own email marketing brainstorming session. What I Like: Well, its colorful I ‘ll give them that. And there’s a big orange “Register Now” right on top so whatever this email is about I know they want me to register. What I Don’t Like: Too busy, too many things happening in this email that makes it very distracting. I had to read it a couple times to understand what the title was because my eyes kept bouncing around. My eyes go straight to that screenshot before I read the copy and so I have no idea what that shot is about. You are really hoping people stop and read the text, which may not happen all the time. 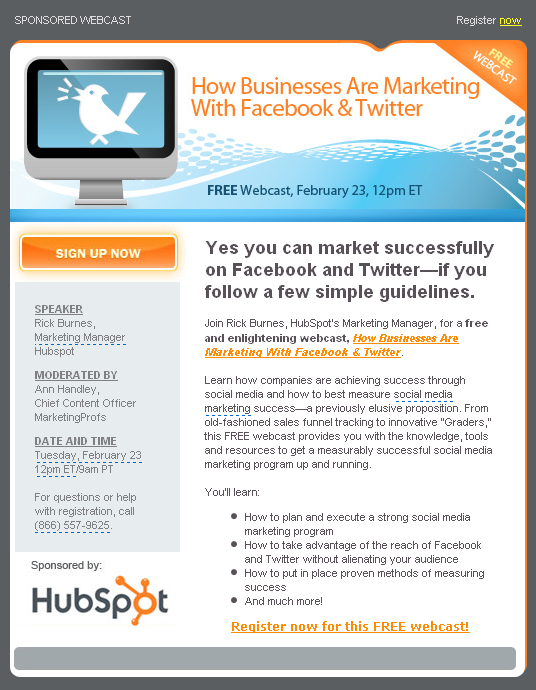 What I Like: Catchy header with interesting graphic, clear title and date/time of the webinar easy to find. 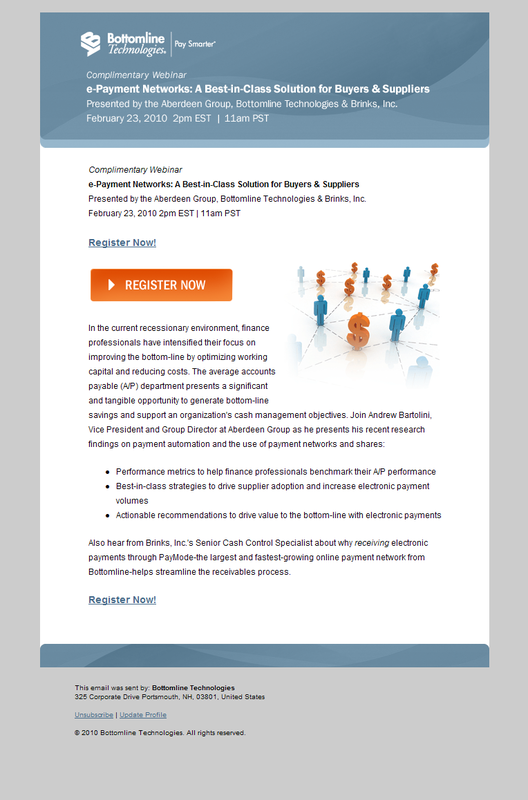 Big “Register for our webinar” button at the bottom makes it easy to find where to click to sign up. Picture of speaker gives it a personal tone. What I Don’t Like: Although the header graphic is good, it could be a bit cleaner (I’d remove the mention of 2 sessions and increase the title a bit); Grey text over grey background doesn’t make it ‘pop’. What I Like: The blue and orange colors go really well with the white background. The picture of the speaker gives it a personal feel. Side banner is a good way to try “sell” additional product and increase registrations. What I Don’t Like: Being an email from MarketingExperiments I was expecting it to be much better. This email is cluttered, is very difficult to determine what exactly are they trying to get me to do. How many webinars are being advertised here? 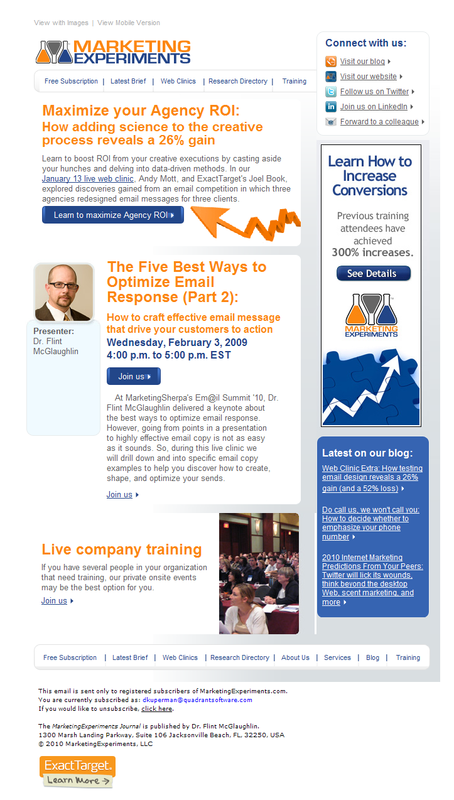 And what’s up with blog posts (side bar) in this email? Too confusing. I think the only good thing going for them is that their name is recognizable and so people may spend some time deciphering their email. What I Like: Really great color combination makes it easy in the eye. Clear header with big title and date/time of the event. Orange “Sign up” button on top left corner is the natural place for your eyes after reading the header and calls attention. Big but concise lead-in. 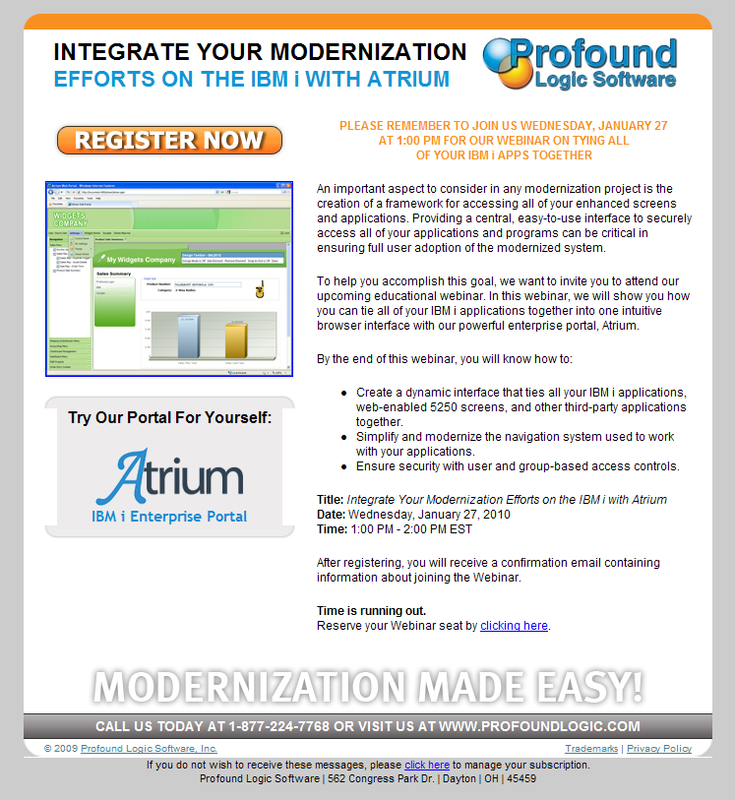 Sponsor logo nicely placed helps give authority to the email. What I Don’t Like: Bullet points could have been more concise; left side bar is grey on grey background which makes it difficult to read. 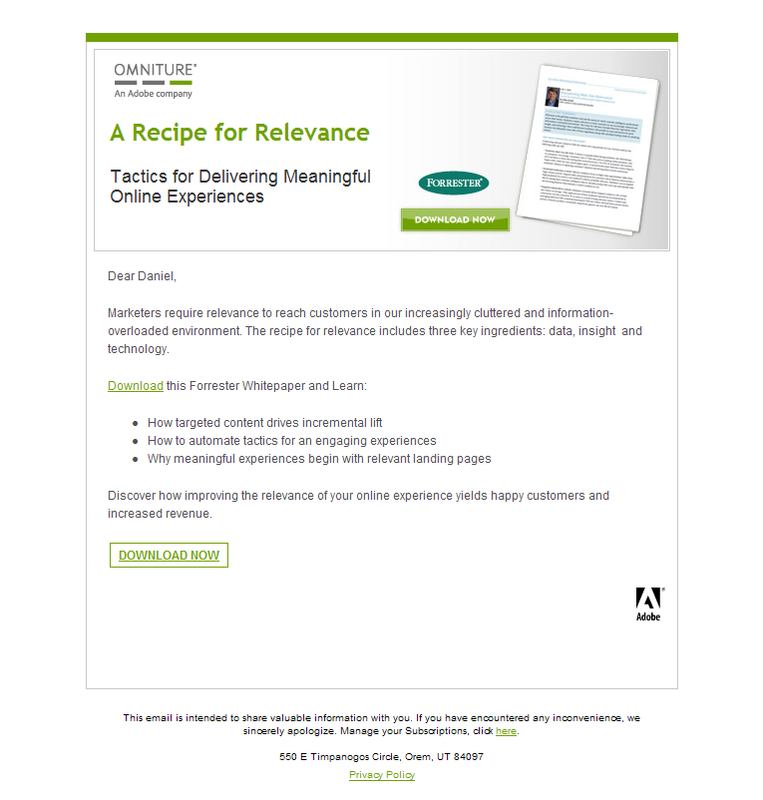 Email Title: What if you had the power to increase campaign response rates and ROI? What I Like:Cathy header and good combination of graphic with text to get people interested. Not copy intensive and good use of bullet points. Big lead-in helps keep users reading. 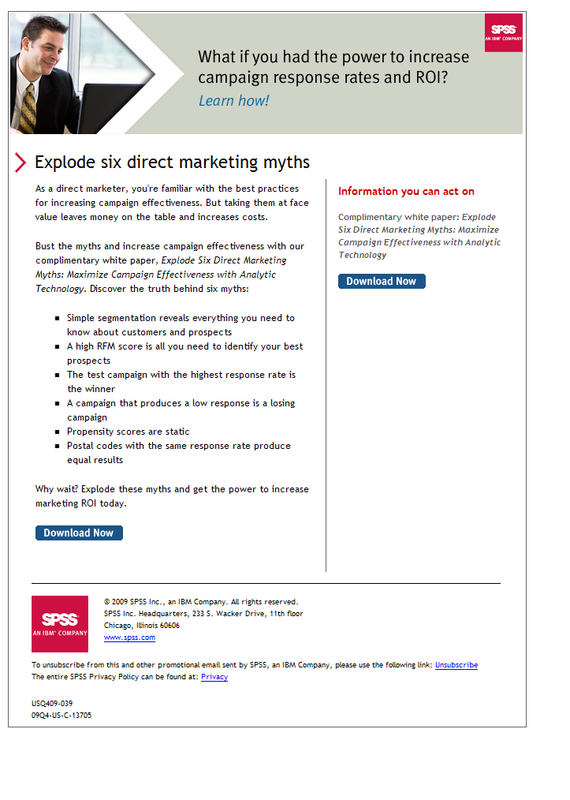 What I Don’t Like: Lead-in copy “Explode six direct marketing myths” doesn’t tell me much, poor choice of words (although ‘myths’ tend to get people to read). Right side bar basically empty, not helping much. No image of the whitepaper that they are offering (images, or “hero shots”, tend to increase registrations rate). What I Like:Clean, nice looking header containing image of the whitepaper and download button. Very light on copy but direct to the point and making good use of bullet points. What I Don’t Like: The ‘download’ button with the Forrester logo on top and right next to the image looks a bit out-of-place, maybe it’s just me? The copy could have been more precise in explaining exactly what the whitepaper is about, looks to me a bit vague. 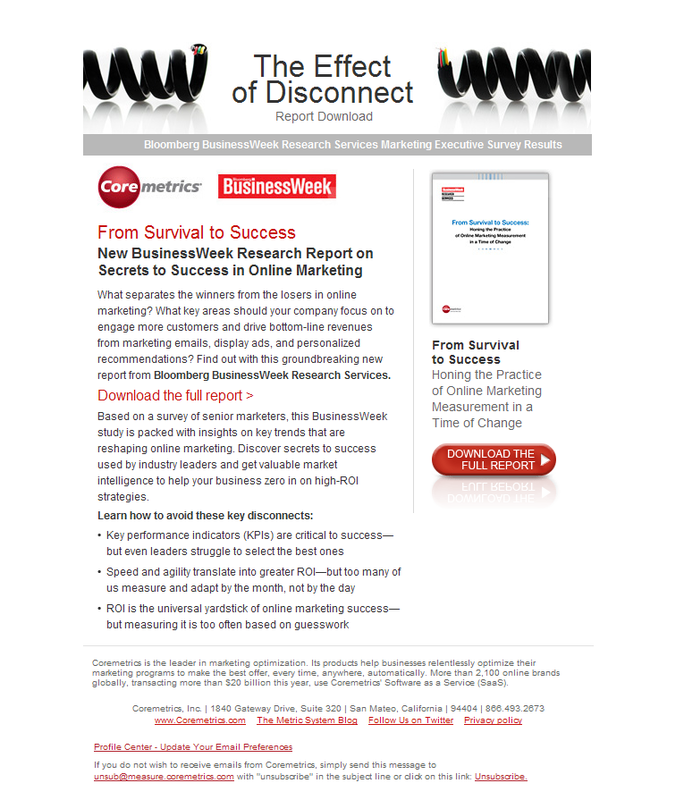 What I Like: The header graphic is not some random image but rather helps drive the point the title is trying to make about “disconnect”. Whitepaper shot on right is the right size (you can read the title of the WP) and right below it is a big red “download the full report” button that you can’t miss. What I Don’t Like: A lot of copy in this email in a space that makes it look cramped doesn’t help the reader. The only “download” link seems to be the red button to the right, I would have added a couple more ‘download’ options either within the text or right after it. What I Like: This is a really nicely designed email. 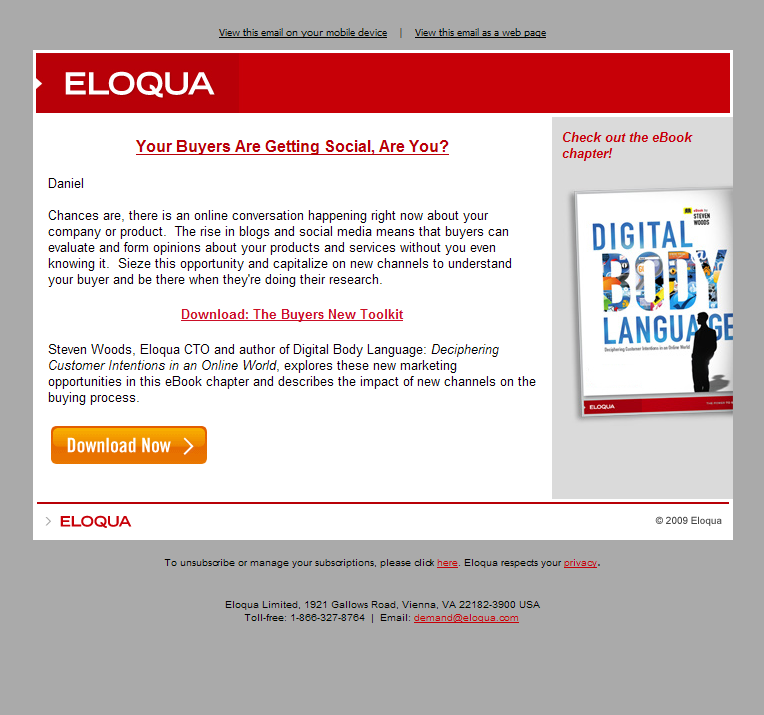 Red header with Eloqua name tells me right upfront who’s behind the email, there’s not too much copy, the right side with the book shot catches my eyes immediately and the orange “download now” button is hard to miss, you know right away where to click to get it. What I Don’t Like: Although the email design is pleasant in the eyes, the message is confusing. The big shot of the book on the right makes me believe that when clicking the “download” now orange button I’ll get that book chapter they talk about, but then there’s that other red download link in the middle saying “Download: The Buyers New Toolkit”. So which one is it? The book chapter or this toolkit? 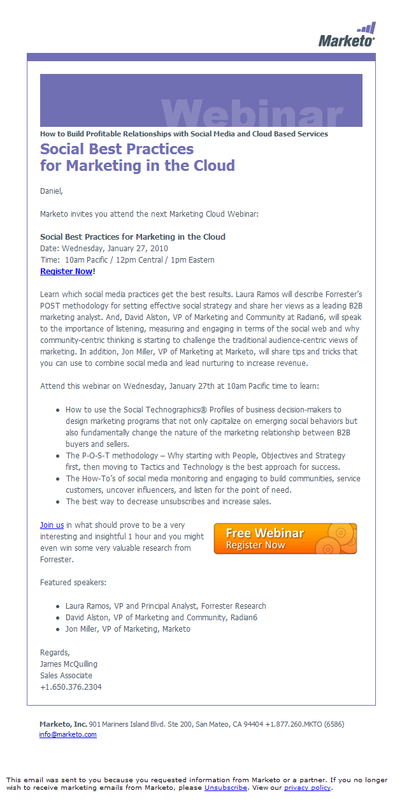 What I Like: Bit header with the title of the webinar also tells me when it will be held. Big unmistakable “Register Now” button right on top. Small graphic image to the right helps balance the copy. What I Don’t Like: The paragraph right below the register now button is huge (9 lines), it would have been better to chop it off and make it a bit smaller, especially because the image to the right reduces available space. The copy is good but lacks some emphasis on important points such as the fact that Aberdeen Group will be presenting and a Senior Cash Control Specialist (a customer, maybe?) will be presenting. If they had bolded some of those names it would have drawn attention to that part of the copy making it easier to read and more compelling. That’s it for this installment of Email Design Gallery. Let me know what you thought of these designs and if you have any to submit, please contact me!